With our great transport links and perfect central location, Linlithgow is a brilliant base from which to explore. We’re right in the heart of the Central Belt of Scotland. This goes from the River Forth and Edinburgh in the East to the River Clyde and Glasgow in the West. 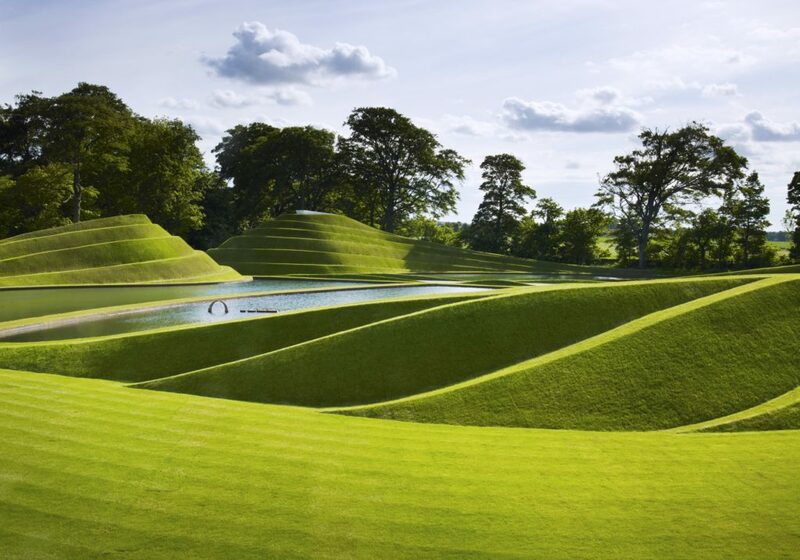 There is so much to to see and do locally that you won’t have to venture very far around Linlithgow for some amazing days out. Visit this castle fortress on the Firth of Forth built by one of Scotland’s most powerful families, the Crichtons. Blackness was the old seaport for Linlithgow in the days of the Stewart Kings. 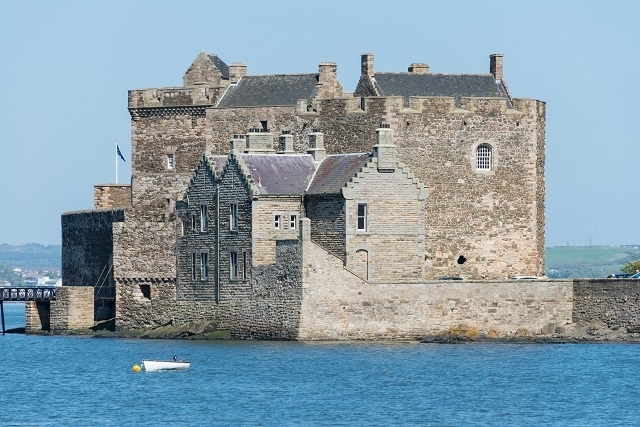 You can visit inside Blackness Castle anytime between 1st April and 30th September. 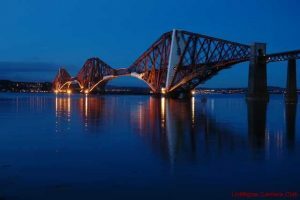 This area is also spectacular for viewing the 3 Bridges at South Queensferry (see below). The first mention of a settlement on the river forth where Bo’ness is now, can be traced back to Roman times. It is thought the are formed the eastern end of the Antonine Wall. Kinneil Estate which includes Kinneil House and Kinneil Museum. The Estate contains part of the Antonine Wall World Heritage Site and one of its fortlets. In addition you can see the site of the deserted Kinneil medieval village (of which only a ruined church remains). It also hosts a section of the John Muir Way which opened in 2014. Acquired during the reign of David I, King of Scots (1124-1153), it became, and remained until the 16th century, the pre-Reformation Order of St John’s administrative centre in Scotland. The Preceptory was also used as a hospital and a place of worship and refuge. Much of what remains today was built in the 1400s. It is open to go inside April to September. Whilst in this area if you are in need of some quiet thinking time and like to walk make a visit to the Korean War Memorial or if you are feeling more energetic take a walk up Cairnpapple Hill (a significant site for ceremonies and burials for at least 4,000 years). There are 170 acres of stunning woodland and parkland to explore. The park also has a mini demonstration farm, a sculpture trail, children’s play area and a café at the Visitor Hub courtyard. The park is free to access all year round and offers spectacular scenery accessible through a network of paths. Hopetoun House and Estate – is often referred to as Scotland’s Finest Stately Home and is a five-star Visitor Attraction. Designed by William Bruce (and then altered and extended by William Adam) Hopetoun House is one of the finest examples of 18th century architecture in the UK. The House is open from April through to September. The grounds at Hopetoun are open all year around. They are the perfect place to watch and enjoy wildlife. Travel into South Queensferry to view the Forth Bridges. You will marvel at The 117 year old Forth Rail Bridge (pictured). You will also see its younger neighbours – the Forth Road Bridge which opened in 1964. The most recent addition is The Queensferry Crossing. Queen Elizabeth II opened the third bridge in August 2017. If you have time, then pop over one of the bridges into North Queensferry to get to Scotland’s national aquarium Deep Sea World. 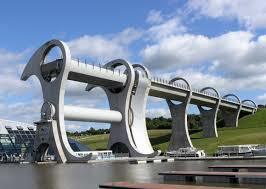 Book yourself a boat trip on the world’s first and only rotating boat lift – the Falkirk Wheel. Be amazed at the 600 tonne gondolas which hold 500,000 litres of water, enough to fill an Olympic swimming pool. Marvel at its design – the Wheel only uses 1.5kWh of energy to turn. That’s he same amount as it would take to boil 8 household kettles. Enjoy a wander around Helix Park ( borne from an idea to create a local greenspace that connects and engages with local communities) and marvel at the Kelpies (two 30 metre high stainless steel monuments that form the vanguard of The Helix and the Forth and Clyde Canal). Callendar House & Park – a stunning 14th century, French chateau styled house, complete with working Georgian kitchen,visitor tea room and fantastic kids play park. Callendar Park also contains a section of the Roman Antonine Wall, a UNESCO World Heritage site. Almond Valley Heritage Centre – have a lovely day of adventure and play for all the family at the farm, museum and discovery centre. Five Sisters Zoo – The Zoo was officially established in 2005 with just a small collection of rabbits, guinea pigs, goats, and pigs. Since then the zoo has grown into an exciting collection of over 165 different species. There are mammals, birds and reptiles from all around the world. The five shale bings that overlook the site gave the Zoo its name. Polkemmet Country Park – located on the former private estate of the Baillie family, who lived on the site for over 300 years. Polkemmet has a rich and varied history and offers beautiful woodland and riverside walks, picnic areas with seating and barbecue facilities and is also home to The Scottish Owl Centre. Jump on the train from Linlithgow to Edinburgh (20 minutes), Glasgow (30 minutes) or Stirling (30 minutes) and explore all these amazing cities have to offer. To browse other places to visit and find out what’s going on across the rest of Scotland see the Visit Scotland website.